Now revealed! The Gray Widow is retiring after eighty years of fighting crime as a super-hero. All those Superman, Batman, Spiderman stories (etc.) were based on this woman, who always kept herself under wraps, except to favorite fiction writers who could keep their mouths shut. In her time ("I wasn't always gray") she had love affairs with both Tarzan and Doc Savage, and although she will never admit it, Bulldog Drummond, James Bond, and Mel Gibson. Her headquarters in a cave on the east coast of Farnish is an early prototype of the secret retreats of all the super-heroes of legend. "I just can't carry on any more," she says, "my arthritis is killing me and that cave is just too damp." In her long career, she never got any publicity, didn't want it, but she struck terror among the ranks of the Mafia, Gestapo, NKVD, and other evil groups dedicated to the corruption of mankind. She would never have revealed the HQ of her secret place if it weren't for the fact "I can't afford to keep it up any more." There were no buyers among the remaining super-heroes, even though she advertised in the Shadow Gazette, so she is reluctantly turning it over to Seth Pottlebury on condition it be kept intact as a permanent museum, with very stringent qualifying tests for anybody who should like to visit it. "Basically, you have to prove not only that you are not evil, but will actively pursue those who would DO evil, and neither stint nor have any qualms about dealing out Death when it is necessary. I dedicate this wonderful and exasperating and difficult-to-reach place to all serious fighters against the enemies of righteousness and the normality of dull, pointless olives (er, lives), which everybody is entitled to live through, if you can call that living." The Gray Widow's Cave is located under the cliffs of the East Fast of the Isle of Farnish. This is a large natural cavern carved out of the solid limestone of that region, with a small underground stream travelling underground from the upper fells (we will not reveal where the pothole comes up, because that is a secret entrance to the cave). It is basically two structures on either side of the wide sea-facing cavern, which is often flooded at high tide, is treacherous to enter except in a well-handled small boat, and at low tide has small rocky beaches; there are landing stages on both sides, the main one on the south, where there is not only a boathouse (and other related things), but also the main guardhouse for the four retainers the Gray Widow always kept in residence. 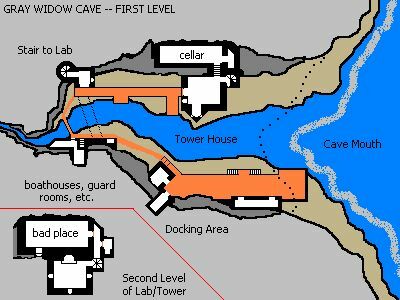 On the north side, there is a four-story tower rising right up to the roof of the cavern, and behind this the 'infamous' labs where the Gray Widow developed her ingenious devices to fight the fiendish measures of her opponents. The main buildings are built on ledges in the higher reaches of the cave, with some rooms carved right into the rock. 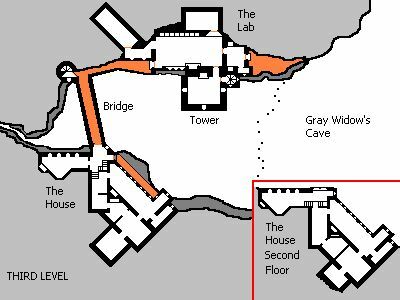 Access to the upper buildings is only via two spiral staircases, one in the tower, the other a separate structure near the small footbridge spanning the outlet of the underground brook (this is one of the reasons the Gray Widow has decided to retire after all these years). The tower house on its lowest level is a guard room where the Castellan Giles resided; above that is a mezzanine floor, Giles's living quarters, with access to what is called the 'Bad Place' -- secret research that should best be left unspecified (Giles was also Head Scientific Inventor, Lab Specialist, and Criminologist -- he was murdered in 1998, but that is another story). Third third level contains the library, and above that is a storage loft. The labs are behind the library. To either side are pavements along an excarpment that serve as terraces, the inner one leading to the main stair tower and the impressive arched bridge leading to the HOUSE. What can one say about the House? Well, it is rather big for just one resident and a few retainers such as a cook and housemaid, it only has windows on two sides (and those face into the dark cavern which only gets direct sunlight at dawn), and it is very expensively fitted out with fine arts and furniture collected over the years by the Gray Widow ("My only extravagence," she said. "I would never accept a reward in cash, but fine craftsmanship is another matter."). Her own private rooms, however, are simple windowless chambers carved into the rock at the second level over the kitchen and pantry.